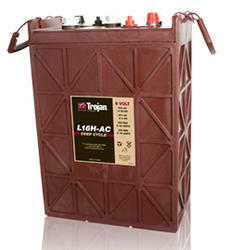 Trojan L16H-AC Deep Cycle 435Ah Battery for Off Grid Systems Free Delivery in the Northeast. Trojan L16H-AC Deep Cycle 435Ah Battery for Off Grid Systems Free Delivery to many locations in the Northeast. Trojan L16H-AC Deep Cycle Battery for Off Grid Systems Free Delivery to many locations in the Northeast. Connecticut, Delaware, Maine, Maryland, Massachusetts, New York, New Jersey, New Hampshire, Pennsylvania, Rhode Island, Vermont, Virginia, West Virginia, Washington DC. If you do not have a commercial address we can make arrangements for a will call pick up at the closest warehouse. We can also have you meet the driver at a commercial location near you to receive the batteries.